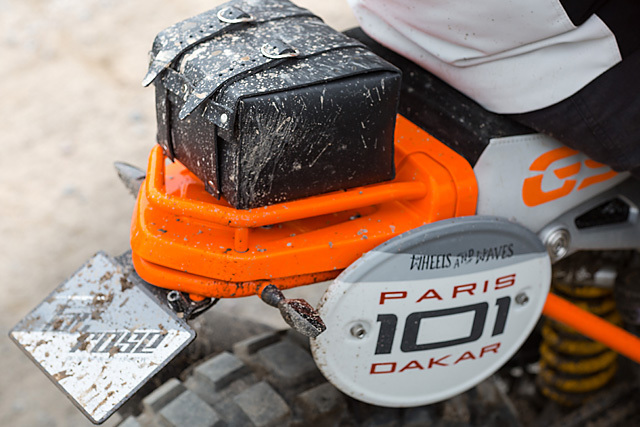 The Paris-Dakar Rally is one of the truly great motorsport events, known around the world the winning vehicles often go on to achieve legendary status and large sales success. The epitome of that notion is the BMW GS series which launched in 1980 and would go on to win the Rally four times in five years. By 2009 that winning formula had resulted in the sale of more than half a million road going versions and the legend of the GS lives on today. 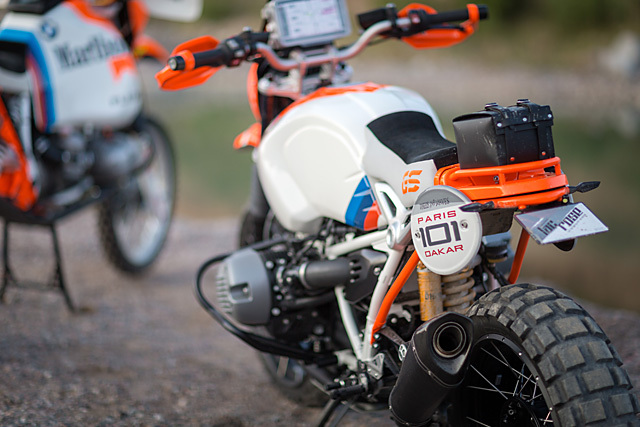 But with the Wheels & Waves Festival kicking off today in Biarritz on the French Atlantic coast, BMW Motorrad decided to pay homage to the desert killer of the ’80s by transforming their latest show room success into this, the BMW Motorrad Concept Lac Rose. Lac Rose is the French name of the rose-coloured Retba salt lake, located 35 km North East of Dakar on the Atlantic coast where the Rally once ended and the podium was placed by the lakeside. 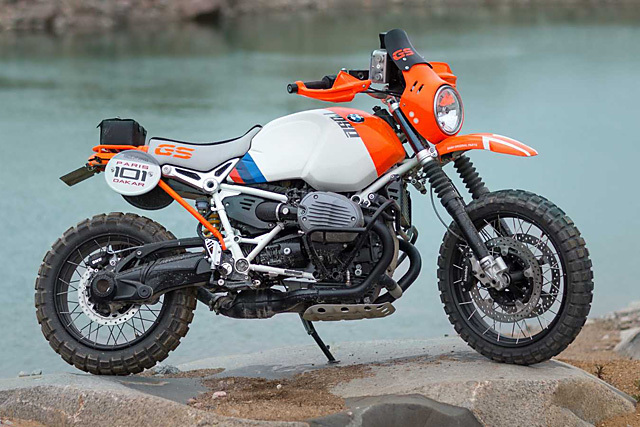 But rather than customise a modern GS to look like its race bred cousin of the 80’s that stood tall on the rostrum, BMW chose to take the new R nineT and give it the Dakar make over. 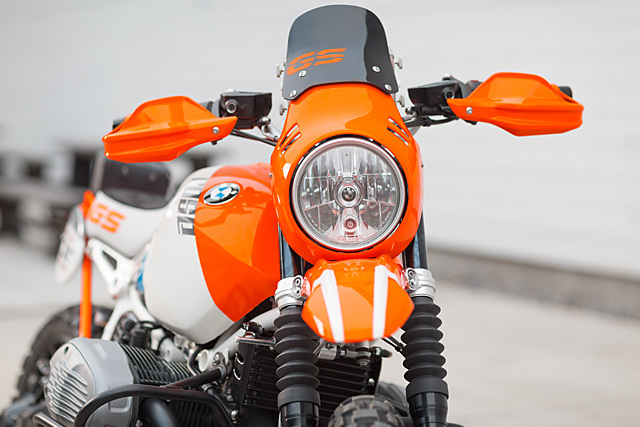 “Since it was first introduced on the market, the BMW R nineT has become a popular bike for customisers and finishers as can be seen at Wheels & Waves. This makes us very proud and spurred us on to create something special for this festival, something no one has seen from us yet”, says Edgard Heinrich, Head of Design at BMW Motorrad. It should of course come as no surprise that the end result is a brilliant tribute to the race winning machine with more than enough historically accurate detail for the enthusiast to get lost in. It’s also just a damn cool bike and puts “into an exciting new context and shows what passion for our brand heritage, imagination and a few modifications can achieve.” The most striking of which is of course the colour combination of signal red on alpine white and the start number 101. It instantly takes you back to the racing machines of old with the headlight shroud and bark busters resplendent in the same colour they wore more than 30 years ago. The same is true of the colour matched rear subframe with those 101 side covers and BMW’s classic blue, purple and red logo at the tail edge of the tank. To get the bike up off the ground for the full off-road look the RnineT’s suspension has come in for a serious overhaul with travel significantly increased. While the wheels are spoked items as worn by the original with aggressively treaded tyres and long gators for the right look. 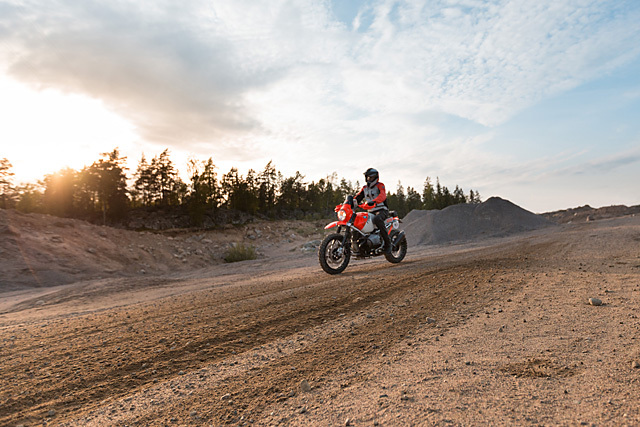 But BMW Motorrad is not pretending the machine is something that it’s not; the concept bike deliberately makes certain sacrifices with race like off-road qualities consciously omitted. 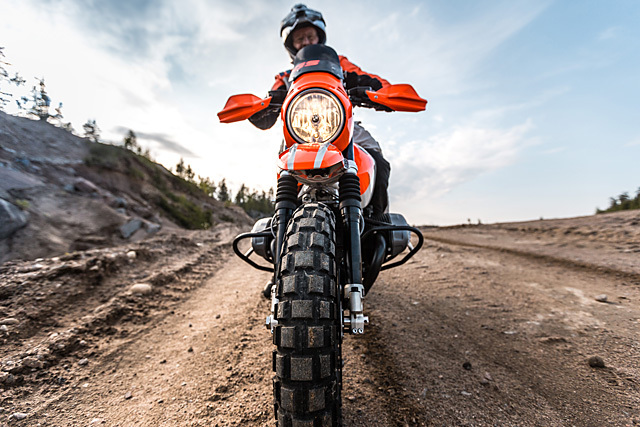 “Essentially the bike is a cool and laid-back roadster with a few typical off-road features which allow you to leave the street and follow a dirt track into the unknown”, explains Heinrich. But there are more than enough Rally parts to allow you to buy into the fantasy of what it would be like to take Lac Rose into the harsh North African environment. 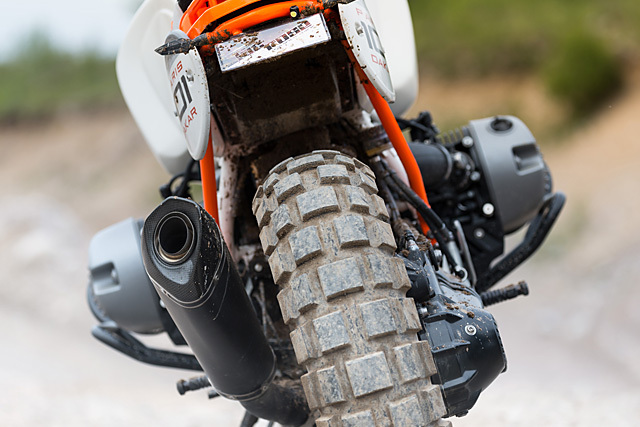 The tinted windshield with typical rally equipment nestled behind it, the characteristically high mudguard design, a large fuel tank and a short rally seat are all reminiscent of the legendary bike. While nestled in the colour matched tubular frame is the hallmark BMW two-cylinder flat twin-engine with shaft drive, centrally located and with a low centre of gravity it was as key to the originals off-road ability as it is to the continuing sales success of the modern design. The oil cooler protector, valve covers and the distinctively perforated underside guard pick up the uncompromising functional design of the race bike and transfer its design features into the modern era. 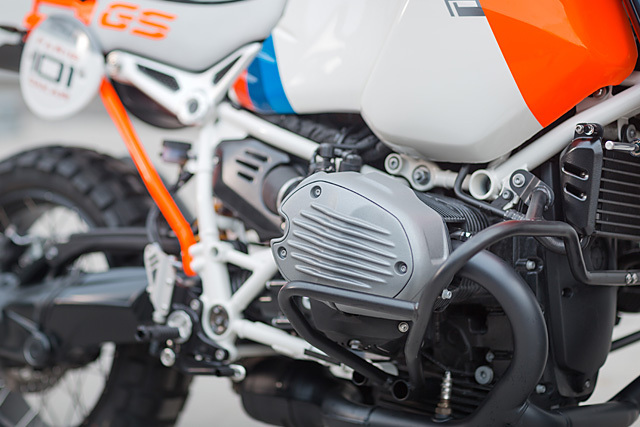 There are a host of other high performance parts fitted, from the rear shock to the new exhaust and muffler combination that make this concept machine unlike any other R nineT to ride. 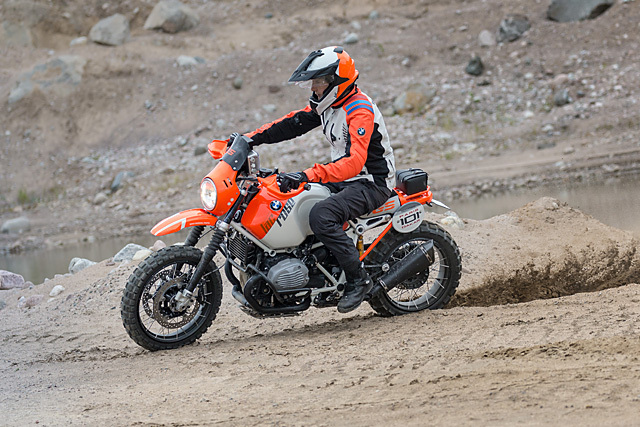 However it’s not just the machine that’s given the retro remake, exclusively designed BMW rider equipment consisting of suit and helmet based on the BMW enduro helmet gives the concept the complete festival appeal. As the main sponsor of the Wheels & Waves event, BMW Motorrad and their stunning Paris-Dakar remake are embracing the free to go anywhere, laid back vibe of the festival that truly exemplifies where the custom scene is at today while pulling on the heart-strings of fond memories from times gone by!